​We have indexed the first 15 volumes of the General Register of Lunatics in Asylum. At present these are the only volumes in the series that are open, and cover the years 1858 to 1918. They are held in the National Records of Scotland under reference MC7. 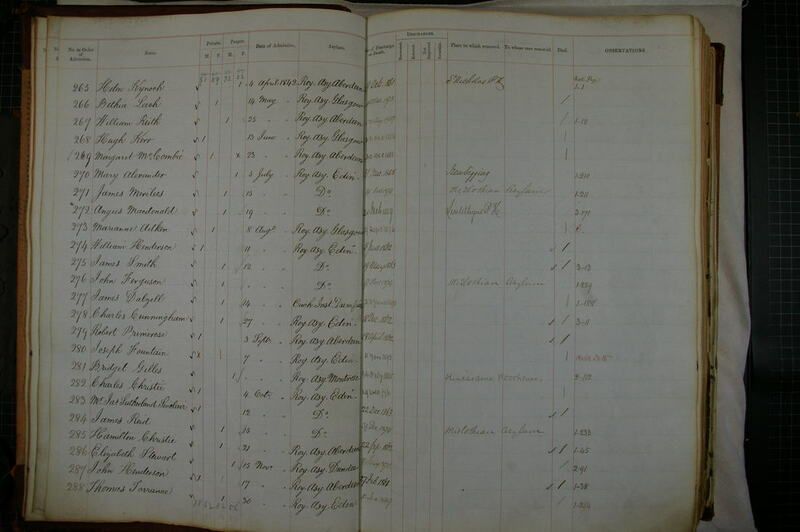 The register covers patients admitted to an asylum in Scotland in this period as well as nearly 4000 patients in asylums on 1 January 1858. Admission Number: unique to an individual carried through from the first to subsequent admissions and other records in the MC Series held by the National Records of Scotland. The index covers 193,606 admissions to asylums, involving 123,500 individual patients. We have consolidated the index so that each entry covers all the admissions for that patient. The index is arranged alphabetically by surname/forename. We have extracted alternative names from the register which may include maiden surnames and aliases so that you can view an individual's entire admission history. We have also included dates of death in an asylum. Although the registers only run up to 1918, deaths were recorded in these registers up to the early 1960s. You should bear in mind that a statutory death record you have for an individual may only show the address of the asylum not the institution name. We will shortly publish addresses for asylums and institutions such as poorhouses with lunatic accommodation. We are also working on enhancing the index with additional information from other sources - primarily from admission documents, as these generally give an indication of when the patient was born, their occupation, and their "home" parish, making it easier to identify individual patients. When you find an individual admission you can order the relevant pages in the register. The number of admissions is shown in brackets by the Order Images link. Our fees are £3 for one image, £6 for two or three images, and £9 for 4 or more images relating to the same patient. The General Register is the first step. Official Notices of Admission survive for most patients admitted after 1858. These were 4-page printed forms submitted by the Superintendents of individual asylums to the General Board of Commissioners in Lunacy whenever a patient was admitted to an asylum. They contain much more information than the General Register. They include a report by the physician admitting the patient, a record of the petition to the Sheriff, biographical and medical information about the patient, two medical certificates (usually including descriptions of the symptoms). In emergencies, patients could be admitted based on a single medical certificate. In such cases, a Sheriff's order was required, and details of this order are included in the form. An example of a Notice of Admission is shown below. If you wish us to research and retrieve a Notice of Admission, you can order here. The General Register and Notices of Admission are records that were held centrally, by the General Board of Commissioners in Edinburgh. Individual asylums also kept records of their own patients. Where they survive, these records can sometimes provide an extraordinary amount of information, particularly in the case notes. 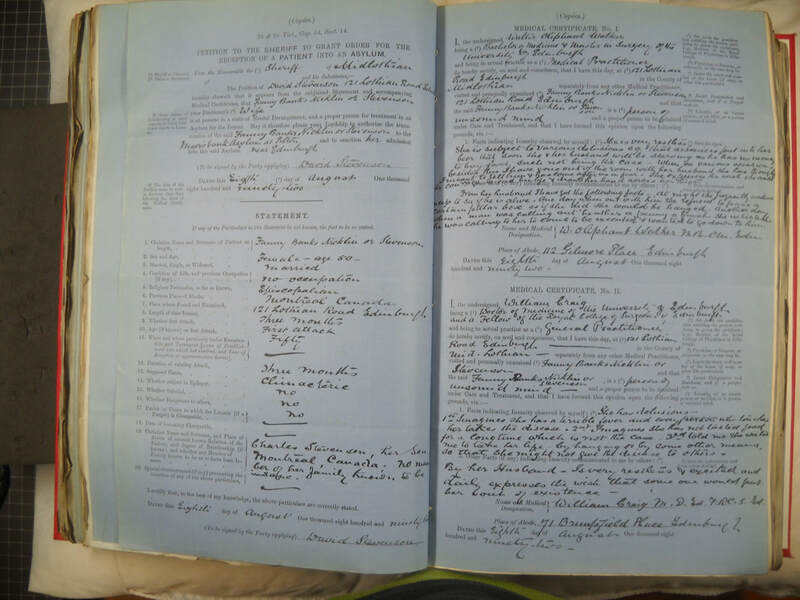 One record we have seen includes details of every bath a patient took over a period of several years, as the asylum's medical officer was a great believer in hydrotherapy. 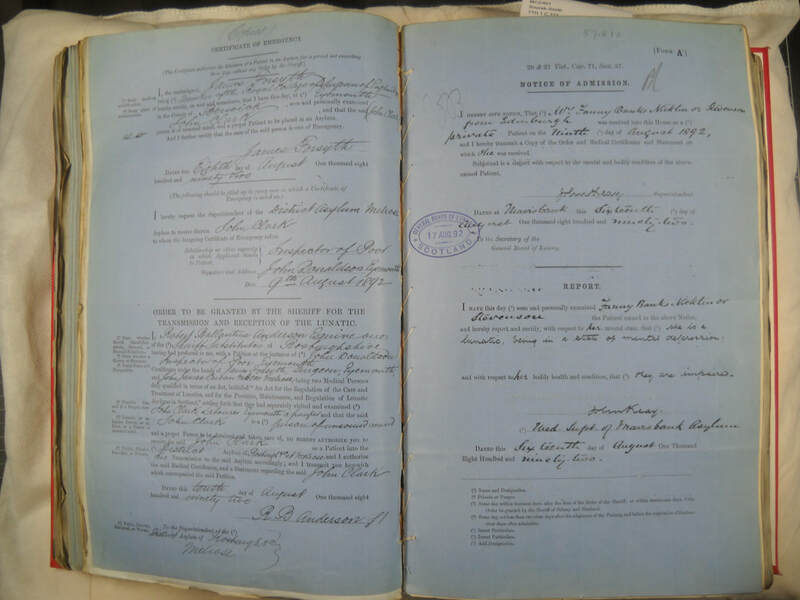 However, not all asylum records have survived. 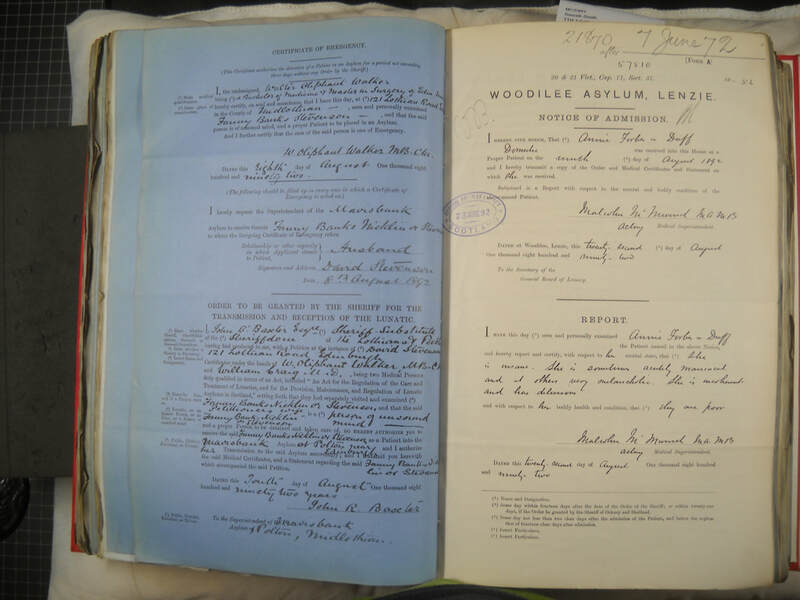 We are currently surveying asylum records held in archives across Scotland, and hope to be able to offer a record retrieval service in the near future.